I like the spirit of Guy Kawasaki’s 10-20-30 rule. If you’re not familiar with it, take a look at this short entertaining video. He is basically saying: don’t overload your audience; keep it simple; and use text that’s big enough to be legible by the whole audience. Amen to all that. However, many people take Guy’s advice out of context and apply it to the letter. Yet Guy was giving advice to entrepreneurs pitching to venture capitalists – a very specific presentation context. He was saying that you should aim to pitch in 20 minutes, with ten slides – and not just any ten slides, but these ten slides (he lists what should be on each slide). Now for an investor pitch, that’s pretty good advice, although it can be taken to extremes, and I’ve already talked about how you need to go beyond being informative, and also make sure your pitch is memorable. But the 10-20-30 advice just doesn’t hold up for any other kind of presentation. The spirit is spot-on, and I applaud Guy’s intentions, but you shouldn’t take his advice to the letter – Guy certainly doesn’t follow it religiously in his recent (very good) Enchantment presentations. Here’s why we need to go beyond 10-20-30. To mark the end of the first season of Le Camping, the Paris-based start-up accelerator of which I’m proud to be a mentor, the Silicon Sentier team organized a fantastic event at the end of June 2011, the Le Camping Festival, for which no less than 900 people signed up. I was asked to give a short keynote presentation on something relevant to start-ups, so being the resident pitch coach, I chose to talk about the art of the pitch. They wanted me to entertain and put on a show, and that’s what I enjoy most, so I decided to create a simple structure, with three easy-to-remember messages, and to borrow the style of Steve Jobs (for the observant, it’s heavily inspired by Jobs’ brilliant iPhone introduction in 2007 – see if you can spot all the references). The young and entrepreneurial audience knew exactly where it came from. So here is the video (8 minutes) – I hope you find it entertaining and enjoyable, and if you can remember the three key messages afterwards, then it will have served its purpose. Any investor pitch – and in fact any sales pitch – will be far stronger with these three key ingredients which all too often are missing. So your pitch hooked an investor – what next? Most advice on investor pitches tends to focus on the first pitch – the few minutes you have with an investor who doesn’t know you or your business. Of course you don’t expect said investor to sign a cheque there and then – that first pitch is only to hook the investor, to make them want to know more. So you managed to hook an investor, and he or she has invited you to a follow-up meeting, which may be an hour for example. What next? First things first: this is a very different animal, and should not be treated the same as your first pitch. Your objectives are different, and your investor’s objectives are different too. Find suitable strategies to communicate each key message memorably. Let’s take a brief look at each of these in turn. 1. Understand your audience. Every investor is different. You already did your homework, so you know this investor’s likes and dislikes, projects they funded which succeeded, projects they funded which failed, projects they refused, etc. That’s a good start. You may have received some feedback after your first pitch, for example on some areas they were unclear on. You could of course ask, ahead of the second meeting, whether there are any areas the investor would like you to cover in particular detail. There might be – and isn’t it better to know before you turn up? It certainly doesn’t hurt to ask, and the investor may be pleased you’re aiming not to waste his or her time. One thing is for sure: this time, you will need to have plenty of details about your plans, your roadmap, and your financials. Most investors will only half-believe your financial projections anyway, but if you don’t have something which looks clear and plausible, or you can’t justify your projections when challenged, then you’re unlikely to be deemed worthy of their millions. Your aim should not be to get through all your slides in the time available without too many interruptions. Think simply: as you leave the building afterwards, what will define whether you’ve succeeded or not? I’d suggest that if you can achieve the four objectives I mentioned above, you’ll be a happy entrepreneur. 3. Choose a few key messages. Remember that detail is the enemy of communication. However, in a case like this, an absence of detail is a deal-killer. So how do you resolve that? Quite simply, you need to separate the details from your key messages. What are the three things you want the investor to remember after the meeting? Not five, not ten – three. They may remember more, but if you could choose three things they will remember during breakfast the next morning, what would they be? Now, in order to get these messages across, you’ll have to give them details, and if you are unable or unwilling to give detailed answers to their questions, you will soon see the inside of their office door for the last time. However, the details are a means to an end – not an end in themselves. Always have your objectives and your key messages in mind, and use every opportunity to get your key messages across. 4. Find suitable strategies to communicate each key message memorably. Don’t expect the investor to remember particular things by accident, or just because they should. You need to make sure that each of your key messages is communicated properly. You may decide that you can use some visuals to help enhance your message and make it more memorable. If so, take note of my slide advice below. You might also use videos, and don’t forget that if you have a product which can be demonstrated, then you should demonstrate it – and make sure it runs extremely smoothly. This is not just a presentation where you take the stage, give your talk, and then ask at the end whether the audience has any questions. This is quality time with an investor. Don’t waste it with one-way communication. So don’t plan your 30-minute presentation and expect it to happen like that. It probably won’t – and if it does happen like that without interruption, your investor is most likely either asleep or bored. This should be a conversation, a discussion – not a broadcast. But visuals can be helpful – there’s nothing better than a good graph to help explain your investment strategy or revenue projections, for example. So here is what I do in these cases. First, I split my material into sections, usually around the key questions investors will want to ask. I then work out what I will need to say in each section to get my key messages across. Everything I say will need to contribute somehow to the communication of those key messages. That’s the test to see whether each point is relevant or not. Next, I work out whether any of those points need supporting materials to help communicate the message memorably. Many of them do not. Some of them will require tables of data. These do not go on slides. I would simply print those tables and give them to the investor at the appropriate time. It’s far easier to understand tables of data on paper rather than on a big screen. What is more, on the screen I could then put a simple graph which illustrates a key data point from the printed table. This helps me to guide the investor’s attention a little. However, if I only showed the simple graph, the investor would not have enough detail to trust what I’m saying. I now have a number of points which require some kind of visuals – which could be videos, demos, or slides. I then plan my slides on paper or in a simple text document. Only then do I open my slideware app and start creating slides. And for this kind of conversational meeting, which most likely will not follow a linear path from beginning to end, I’ll create a particular kind of deck, which is more like a web site than a typical linear slide-deck. Earlier, I split my material into sections (e.g. ‘Financial Projections’ might be one section). I’ll therefore create a kind of ‘menu’ slide where I put a box or picture representing each of the sections. I then create a title slide for each section, and then I create the ‘content’ slides I planned on paper earlier. So far, hopefully that’s clear, but it’s not particularly special. The trick, though, is this: once you have created all your slides, go back to the main menu, and insert hyperlinks on each of the boxes/pictures. These hyperlinks should take you to the title slide of each respective section. On each section’s title slide, you should put a hyperlink back to the main menu, and a link to each ‘content’ slide in that section. You could do this in many ways – perhaps by saving each slide as a picture file, then including thumbnails of each slide as hyperlinks. Or you could use text hyperlinks (less attractive, but perhaps clearer). Or create some other kind of icons if you want. The aim is not to impress the investor, though: the aim is to give you a very easy way to navigate inside your slide-deck. Lastly, on each ‘content’ slide, add icons with hyperlinks: one should take you back to the title of that section, and the other should take you directly to the main menu. Now with no more than three clicks, and usually only two, you can reach any slide in your deck. So when the investor says: “Show me your risk assessment” you will be able to get to that slide in a matter of a few seconds, instead of exiting the slideshow, searching for the appropriate slide, and then starting the slideshow again. Of course this won’t work with most ‘clickers’ which only allow you to move forward and back, but in this kind of meeting, you can probably afford to use a mouse to control your slides. This is also perhaps the only situation when I would give an investor my slides in a PowerPoint or Keynote format, so that they can play around with the menu system as well. Usually I’d only give a PDF handout with plenty of notes. So now you can answer any question quickly and professionally; you can communicate your information in an order which suits the investor and the way the conversation is going; and by letting the investor ask questions and dictate the pace and order, you’re showing him or her respect, and ensuring you don’t waste their time. Through your main menu, though, you are also letting them know that you have great and interesting material on various subjects, and if it’s all prepared well they’ll hopefully want to see what you have in each section – so you are still defining the content of the meeting. I find this a flexible way of communicating key messages in meetings like these, and hope you find this useful advice. Let me know whether it works for you! Yesterday was Investor Day for the first group of 12 start-ups at Le Camping, the Paris-based accelerator of which I am increasingly proud to be a mentor and pitch coach. And it went extremely well. The @lecamping pitches were collectively the best I’ve seen out of an accelerator program in EU. Very slick and well prepared. Instead what we had was the opposite: a crop of amazing startups that wouldn’t look out of place one bit in Y Combinator’s best crop or in any top VC’s portfolio. Very positive feedback from @lecamping Investor Day from my team. Congrats to the Campers! Overall pitch quality is excellent #lecamping and these are not native speakers – very impressed! 1. Adapt your content to meet your audience’s objectives. – What’s the problem you solve? – Why do you solve it better than competitors? – Why are you the best people to make this work? – What are your financial forecasts? – How much money do you need? – What are you going to do with it? They all finally understood the importance of talking about their team members and explaining why they were worth investing in, and they all did it very well. Now this was an area where they all made significant improvements. When Cyril Dorsaz from Beansight said he was excited about working with a great team, he sounded like he really meant it. Every single presenter had improved within their own style to a point where they were credible as leaders and as entrepreneurs. Even though there was a world of difference in styles between the fairly restrained but professional style of Sébastien Lefebvre from Mesagraph and Philippe Langlois from P1 Security on one hand, the smooth salesmanship of Bora Kizil from Zifiz on the other, or even the cool relaxed style of Benjamin Hardy from Kawet, each of them was perfectly suited to their company and their approach, authentic, and communicated clearly and powerfully. As a coach, I certainly don’t try to make everyone pitch in the same way, with the same style or storyboard. I just try to make them pitch as best they can in their own style, and choose a storyboard which suits their key messages. It would have been very boring if we’d seen 12 almost-identical pitches. So that’s Zifiz: we’ve got a huge market opportunity, a fantastic product and a great team. The only thing missing [short dramatic pause] is you. Thankyou. Beyond these four points, there were other great improvements though. Fabienne Rousseau from Itipic blew me away with the clarity of her speech, which improved remarkably over the last month. Clément Cazalot from docTrackr integrated a striking but fun introduction which immediately showed the problem they solve. And Benjamin from Kawet showed the greatest improvement of the lot, integrated a brilliant video to advertise what their product does, and because he had worked very hard at his pitch, he was even able to improvise a few funny remarks which the audience loved. Proof that the more you prepare, the better you are able to improvise. And lastly, the visuals were excellent: simple, with large font sizes, a minimum of text, striking images, good example videos, and plenty of black slides. I even have to praise PrepMyFuture, who produced the best slides I have ever seen which include a comic font – yes, I advised against using it, and still would prefer a different font, but it worked well enough and they used few enough words that it didn’t really matter. Great use of images. I haven’t mentioned everyone but they all did so well and I am honoured to be a part of Le Camping. Alice, Aaron, Omar, Shawn and the whole team did a fine job making it all run so smoothly, finishing right on time (astounding for any event in Paris, let alone one like this), and giving an extremely professional impression. Pierre Morsa and I received many compliments afterwards from entrepreneurs and investors alike about the value Ideas on Stage had added, and while of course that’s very welcome, the real praise should go to the entrepreneurs who put in the hard work and the people at Le Camping who made it all possible. They showed the power of a great pitch, and gave themselves a real chance to get funding. And if they raised the bar for all future pitch events, that can only be good news for us. Tomorrow I’ll give my last pep talk to the entrepreneurs at Le Camping in Paris, before going into coaching mode for their pitches for Investor Day next week. My message will be clear and simple. Be worth talking about. Be memorable. It doesn’t matter how good a pitch is. If it’s not memorable or worth talking about, it will be quickly forgotten. Not being talked about is the worst thing that can happen to an entrepreneur on Investor Day. Being talked about for whatever reason is an excuse to have a conversation with an investor. So I’ll ask them to find something that investors will want to talk to them about afterwards. After all, the pitch is just the hook to make investors want to know more. If they can’t find anything, maybe they need to think about more than just their pitch. Most campers pitch tents. These pitch start-ups. They are the entrepreneurs at Le Camping, the latest start-up accelerator in Paris, and my role (together with Pierre Morsa) is to help them to make a fantastic pitch on Investor Day, when they will compete for attention from various investors, and hopefully attract funding to develop their businesses. After our latest coaching session yesterday, I’m pleased to say they have made great strides in terms of using attractive, simple and relevant slides, with few words (in most cases) and some good use of graphics. They have also mostly worked on their introductions, although some can (and must) still make them more memorable and catchy. Some are still looking back at their slides too often, and there are still plenty of ‘ums’ and ‘ers’ to iron out. That will improve with more practice. Four things in particular are missing though from most of the pitches, and I’d encourage everyone to think about these points in terms of your own presentations (pitches or otherwise), because they are the difference between a good performance and a great one. 1. Adapt your content to meet your audience’s objectives. They are still spending too much time talking about their products or ideas. This isn’t a sales pitch. Investors want to know you have a product that can make money, of course, but it’s the money that’s the key point there, not the product. Your product is not your business plan – it is just a way of giving investors confidence that you can achieve your business plan. While for you it might be your big idea, for an investor it is only your first idea – and hopefully not your last. It might turn out not to work, or a major competitor with a huge cashpile might choose to enter the same market and squash you. What investors need to know is that you are smart enough to come up with other ideas and make them work if the first one doesn’t. They are investing, above all, in a team, not in a product. Better a great team with an average idea than an average team with a great idea, as investors often say. So tell them why they should trust you with their cash. 2. Vision. If I’m investing in you and your company, I want to know it’s a good bet not just now, but for the future. I want to bet on someone who’s going to make it big, or who at least will give it a damn good try. If your vision is limited to “we’re going to launch this product”, that doesn’t give me much long-term confidence. Aim high. Investors don’t want small wins – their choices fail so often that it’s only big wins that make up for the losses. Better to have a 1% chance of being a $billion company than a 20% chance of being a $10million company. So docTrackr, for example, should not just aim to sell a great document security solution. Yawn, so what? But if they stated a vision to be the world leader in document security within 3 years, and to be bought out by Microsoft, Adobe or Google within 5 years, then as an investor, that would make me sit up and take interest. 3. Passion. If you’re trying to make me enthusiastic about your investment opportunity, I need to know and feel that you are enthusiastic about it. If you present as if you either don’t believe in it, don’t care about it, or don’t want it, then I’m not going to want it either. Don’t be quiet. Don’t be monotonous. Don’t be boring. Enthusiasm is contagious, so if you present like you really believe this is an exciting investment opportunity and you have a fantastic team, your audience might start to believe it too. Boredom, on the other hand, is even more contagious. So if you sound flat and boring, the audience will just use your talk as an opportunity to check their email. Be passionate. Don’t be afraid to show that you care and that you believe. 4. A great conclusion. Too many of the pitches are currently just dying, as if the speaker has run out of things to say, or run out of time. Yet the conclusion will determine whether people remember something, or nothing. So it absolutely has to be brilliant. These do not make good conclusions. This was one of the better conclusions. It was a clear end-point, it reminded the audience of the company name and its tag-line, and it used a neat play on words to remind investors that they’re looking for funding (which was explained earlier in the pitch). If any of those questions remains unanswered at the end, or the audience forgets the answers, you have failed. Your conclusion should remind people of these points. Remember Lewis Carroll: “What I say three times is the truth.” Say something three times, and you significantly increase the chances of it being remembered. Say something once, however, and expect it to be forgotten. So use the conclusion to state your key points for the third time – or at least for the second time. Think of your talk as a matchstick. When you light a match, it sparks brightly, and then starts burning slowly along the stick. That’s your high-impact introduction and the middle part of your talk. But a typical match will then just burn out. So your talk has to be like a double-headed match, with a bright, high-impact conclusion to match the introduction. Lastly, in a context like this where the pitches will happen in front of a large audience, with no Q&A session, the intention is not to finish presenting and start discussing: each presenter should aim to leave the stage to a large round of applause. I’d therefore point you to this article where I talk about the importance of applause and how to make sure you get the audience to clap. Adapting to your audience’s objectives, communicating vision, presenting with passion, and nailing a great conclusion: if the Campers can get these four points right in the next few weeks, they’ll be ready for Investor Day. If you can get them right for your next talk – whatever it is – you’ll turn a good presentation into a great one. Does ANYBODY like slideuments? Really? I’d be surprised. Yet this was the question I found myself faced with today at Le Camping, the new start-up accelerator in Paris, where I was mentoring some of the bright young entrepreneurs who were preparing their investor pitch. The trouble is, they had received conflicting advice. I had given them a primer on presentation skills (which you can review here), so they were preparing talks with simple visuals which are aimed at supporting an oral message. However, another mentor told them that investors always want a printed copy of their slides on which they can take notes, and the slides need to stand alone, i.e. include lots of text. Faced with this apparent conflict, I was asked how to resolve it. Here are my thoughts on this. Firstly, the other mentor is clearly right about a few things. Investors generally do like to have a handout on which they can take notes, so if you’ve prepared a nice slide with a black background and six words, and if you’ve printed full-page slides for your investors, they won’t have much room to write notes, but they will need plenty of notes to complement your simple slides. So clearly that’s not ideal. The conclusion could be that you should use a white background for your slides, leave plenty of open space, and still print them full-page. 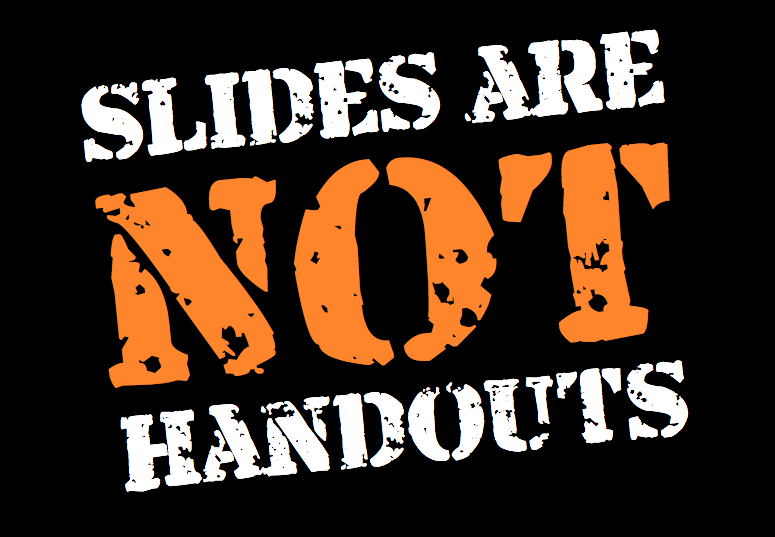 I would make the point that slides are not handouts. Or at least, good slides are not good handouts. Yes, give the investors a document which gives them the overview of your pitch long after they have forgotten what you said, and allows them to take notes while you are pitching. Yes, make sure it follows the presentation closely. But no, what is on the wall does not have to be what’s on the piece of paper. What if you want to include a short video in your pitch? Can you print that? No, of course not. You also can’t print a product demo. But if you prepare a suitable document for your investors to follow, then you can include some notes about the video and the demo. So I would recommend producing some simple, clear and attractive visuals to support your pitch, and to help you to hook the investors and keep their attention; and separately to produce a document which you can print as a handout, with space for notes, which follows the same storyboard as your slides, and potentially includes the slides themselves. Usually what I would do is to put notes in the notes pages (in Keynote or PowerPoint), and print the notes pages to a PDF. This way, on each page, there is the slide at the top, followed by the notes, and followed by white space (assuming you didn’t fill the page with notes). More details here. What’s the alternative? Forget all the cognitive science and evidence, and bombard the investors with slide after slide of bullet points? No. 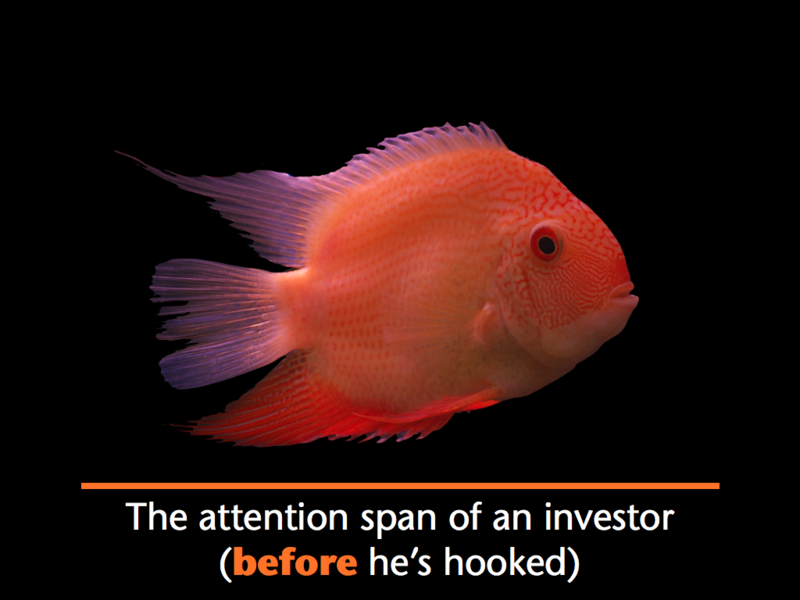 Investors generally have the attention span of a goldfish, unless you have hooked them – in which case they will be all ears. You have to hook them in the first 30 seconds, and keep them hooked. It’s tough. These guys see entrepreneurs all the time, and the vast majority of pitches are unsuccessful, so they are partly expecting you to fail, and will seize on any weakness like sharks smelling blood in a lagoon. And they all have smartphones with which you are competing for their attention. So you have to hook them, and you have to stand out from the crowd to be memorable. As Seth Godin would say, you have to be a purple cow. If you’re not memorable, you won’t get funding. So while the other mentor tells entrepreneurs that they must all produce 10-slide slideuments with a white background and lots of text, I tell them to stand out from the crowd – while remembering to adapt their pitch to their audience. But adapting to your audience doesn’t just mean feeding them the same stuff they always eat. That’s not necessarily what they like the most. If that were the case, the Japanese would hate Garr Reynolds’ slides, but in fact they love them. My cat has the same boring dried cat food every day, but give her a sniff of an empty yogurt pot and she’ll be all over you. Investors see boring standard cookie-cutter slideuments all the time. Does that mean they’d hate it if you pitched to them like Steve Jobs? I don’t believe that at all. The entrepreneurs I’ve coached have all had great success with a proper visual presentation, which helped them to rise above the crowd of slideument-wielding wannabes. 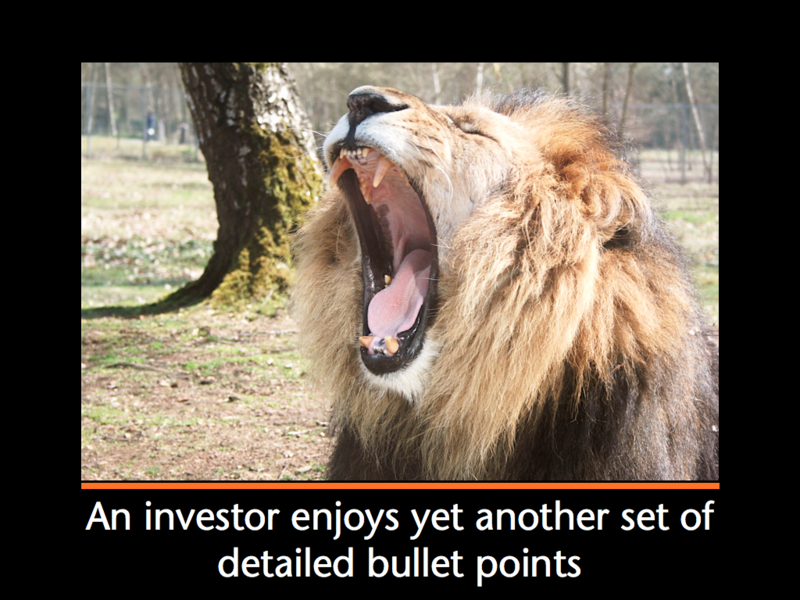 Try hooking investors with a hail of bullet points. Just try it. It’s like trying to hook a fish with a hula hoop. They’ll be bored before you know it – and investors have a much lower tolerance of mediocrity than most people. Bore an investor, and your only chance of funding is if you’re so bad he pays you to stop. Instead, be memorable, select your points carefully and give them the maximum impact with strong visuals, ensure you are answering the questions in the investors’ minds instead of just explaining what your product does (you’re pitching an investment opportunity, not a product), and give the investors a suitable handout which follows the same storyboard and leaves space for them to take notes. Far better to give them good slides and a good handout than a single deck which is good for nothing. What do you think? Are you an investor? What kind of pitches do you best appreciate? You are currently browsing the archives for the Pitch category.